For the Arizona Coyotes, this was a statement game. Despite a sub-par season and disappointment on many levels, the opponents on Saturday night at the Gila River Arena, the Detroit Red Wings, provided the Coyotes with an unique opportunity. Through various lapses in so many games this dreadful season, the Coyotes appeared to lack energy, seemed to skate in sand, and guilty of a plethora of giveaways. Coming into the game, the Red Wings had the fifth best record in the NHL and captured 11 of their last 13 games. With 69 standings points. they trailed Atlantic Division-leading Tampa Bay by two points and only the Lightning, the Preds, the Blues and Ducks had amassed more standing points. That success supplied enough of an august challenge for the Coyotes to recognize. The need to keep up with one of the elite teams as well as demonstrate they did not lose their collective character and energy was clearly on the table. Despite a disappointing 3-1 loss to the Wings before a sell-out crowd of 17,125, the Coyotes, at least for one night, showed they can stay with the best. With a 1-for-5 night on the power play, the Wings were essentially held in check by one of the worst of the penalty-killing teams in the league. Coming into the game, Detroit had the top-ranked power play, and the Coyotes were 27th facing the man-disadvantage. That Wings power play tally by Riley Sheahan at 8:11 of the second period came off a turnover from the Coyotes’ Tobias Rieder from inside the Arizona zone. Still, the Coyotes’ effort was solid and drew praise around the dressing room. While the Coyotes can use more overall team speed, their tenacity to the puck and clearing in front of goalie Mike Smith were lost aspects of their game. Plus, checking hard around the dasher boards and standing up Wings all over the rink were also dimensions missing from past games. The Coyotes’ effort and Tippett’s ability to push the right buttons on this given night did not go unnoticed. After Sheanhan popped in his ninth of the season and fifth on the power play, the Coyotes had a great opportunity to tie. 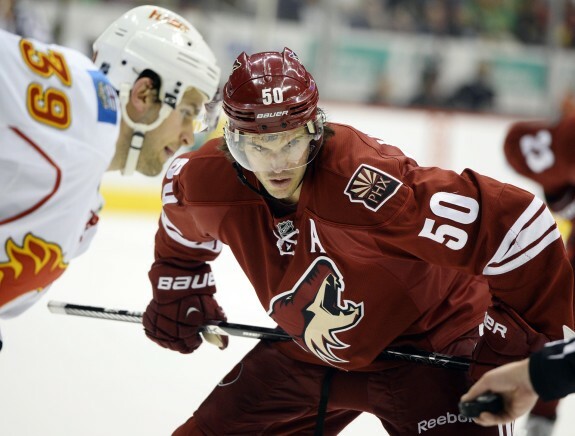 In the middle of the final period, Arizona defenseman Zbynek Michalek was called for hooking at 10:19. Shorthanded, Martin Erat broke in on goalie Petr Mrazek alone but was taken down and a penalty shot awarded. Attempting first to go the back-hand and then the fore-hand, Erat shot into Mrazek’s left pad, and was stopped. While the result continued to be discouraging, the effort could signal a change. If all else, the Coyotes demonstrated the ability to hang competitively with one of the best teams in the league and control their fate. Those are two factors of their game which have been elusive all season. Keeping with his reputation as one of the effective offensive-defenseman, Keith Yandle has risen to the head of the class. With an assist on Oliver Ekman-Larsson’s goal at 18:06 of the third period, Yandle amassed 34 assists on the season, and that’s tops among NHL defensemen. With the Wings’ game, Yandle has picked up points in his last six games and in 10 in his previous 11 contests. In terms of goals, Yandle scored four so far this season, Oct. 21 at Nashville, at Vancouver Nov 14, Nov. 29 at Anaheim, and Dec. 23 at Edmonton. Despite his production, Yandle had yet to score at home.